In 2002 we purchased the former Beebe-Dewey Funeral Home in Ithaca. 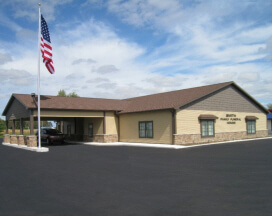 After remodeling and being in that facility for 8 years; our family decided to look for a new location within the Ithaca City limits to build a new funeral home. In the spring of 2010 we started building the new Ithaca Chapel. It is now a completed beautiful ground level building with easy access at 1333 East Center Street. There are plenty of parking spaces and it has 3 chapels that can be made into 1 large chapel to accommodate larger families. The building has a family lounge, an arrangement office, 2 handicap accessible restrooms and a complete embalming room.